Nestled in a small strip on the North side of Bordeaux sits L'Oiseau Bleu, a contemporary and creative restaurant known for its attention to detail and finest ingredients. The French menu caused some initial difficulty, but our adorable waiter did his best to translate. I personally found it fun to pick my dishes with slight uncertainty of every culinary flourish - but I knew we wouldn't be disappointed in the outcome. And we weren't! We began with my new favorite wine of the summer: a 2009 Pomerol from Chateau du Couvent. The ruby red flavor was smooth as ever. Mom, Dad and Hannah started with a cold carbonara (pasta). We laughed at their plates, because they looked NOTHING like the traditional Italian plate one would expect. A molded cylinder of squid ink pasta sat on a gorgeous layer of white asparagus pureé and white truffle oil. A single uncooked spaghetti noodle added height to the unthinkable presentation. I decided to be out of the box and try the shrimp appetizer, which arrived as a soup, to my surprise! It of course exceeded my expectations. The slightly sweet cream base had large pieces of wild prawn, chives, baby croutons and some other unknown ingredients. I was infatuated by the flavors. The key words of our entreé course: "foam overload." We were hysterical over the abundance of different foams on our plates, but it indeed was an interesting concept! My entree was a gorgeous fillet of redfish with a foam (duh) and sweet potato mash. Dad and Hannah loved their Royal trout with Ethiopean eggplant cream and marinated pepper. My mom's was the winner, though: tender fillet of pork (cochon) with a single swirl sweet potato chip and potato cake made of dozens of layers of paper-thin potato. The skill behind each dish was phenomenal. We didn't have room for dessert, but baby rum cakes, marshmallows, and jelly candies accompanied our bill. L'Oiseau Bleu was beautifully original and consistently strong. It was my favorite in Bordeaux, if not all of France! After one busy month of fast-paced Paris culture, I was ready to unwind. My parents arrived on Thursday and a sweet reunion was in full swing! 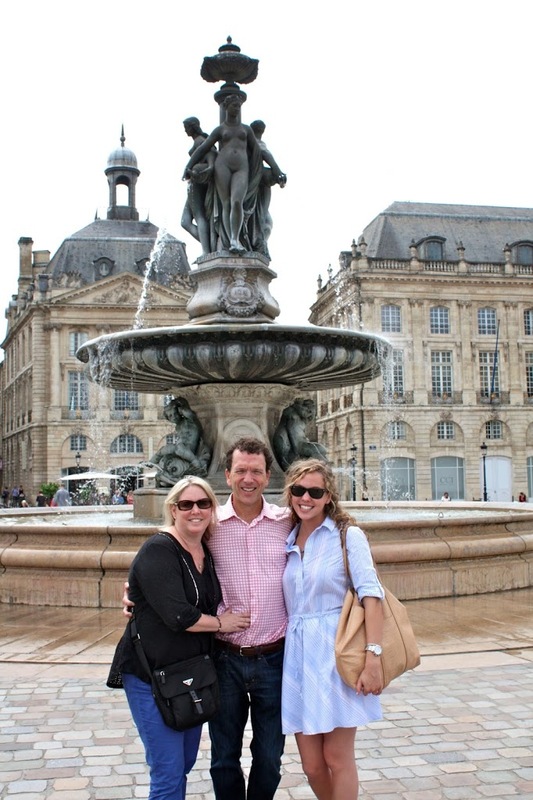 Our five days together in France was centered around a weekend getaway to Bordeaux in the southwestern region of country. The slow-paced city, which has received a cultural renaissance in the past two decades, was filled with quaint shops, restaurants and daring Medeival architecture. I handled the restaurants (with Hannah's spot-on TripAdvisor suggestions), Dad handled the daily activities; all was swell for our Greenstein Bordeaux adventure. Every meal across the town was a constant hit! I've written up L'Oiseau Bleu and Plume Small Kitchen separately, so be sure to check out those critiques soon. We also felt like locals when lunching at the La Brasserie Bordelaise on Friday AND Saturday. Our sweet waitress Ophelia brought us classic French fare to welcome us to the city on Friday, and we couldn't get enough. While Friday was a heartier afternoon meal of farmhouse chicken with au jus and huge scallops, Saturday's cheese board and juicy tomato gazpacho was a lovely precursor to our Saturday afternoon: Bordeaux 360 Wine Tour. Yes, Chateau hopping was the highlight. We ventured to the Saint Emillion region in the northeast area of Bordeaux, getting a taste of the wine, land and deep history of the area. Our guide Chloe showed us two Chateaus; the first (Chateau Mauvezin) being a quaint home with a tasting led by a owner, whose family has made wine for 400 years...the second (Chateau Soutard)being a large, modern mansion with tens of acres and fancy shmancy cellars underneath the Saint Emillion layer of natural lime stone. I was equally amazed by both estates; and their red wines (predominantly merlot and Cabernet) were mighty tasty. My dad got a 2005 bottle from Chateau Soutard, which we have decided to wait and open when I get back home to Memphis!